Textbook, Cambridge University Press, ISBN 9780521877763, 2009. "The reference on Constraint Handling Rules, covering both theory and practice." "This is a great book illustrating both the simplicity and power of Constraint Handling Rules, the purest form of rule based programming I know." Available everywhere, e.g. at Cambridge University Press, amazon.de, amazon.co.uk, amazon.com, amazon.fr, amazon.it. Book Review by Eric Monfroy in TPLP Journal. The companion book is "Constraint Handling Rules: Compilation, Execution, and Analysis" Thom Frühwirth, Frank Raiser (editors), 2018. What are Constraint Handling Rules (CHR)? "...one of the most powerful multiset rewriting languages." "...a powerful, highly optimized, lazy rule engine [...] consistently outperforms Rete-based systems." "... [Concurrent CHR in Haskell] exhibits significant speed up in most problems when executed on multi-core systems." "Since CHR seems to subsume most of the other formalisms that have been related to it, it has the potential to become a lingua franca, a hub which collects and dispenses research efforts from and to the various related fields." Constraint Handling Rules (CHR) is both a versatile theoretical formalism based on logic and an efficient practical high-level programming language based on rules and constraints. - Slides of CHR Keynote Talk, Thom Frühwirth at RuleML 2015. - Constraint Handling Rules - What Else?, Thom Frühwirth, Survey, 2015. - Online Interactive Constraint Handling Rules CHR WWW Demo Tool. - Constraint Handling Rules (CHR) bibliography and news blog. 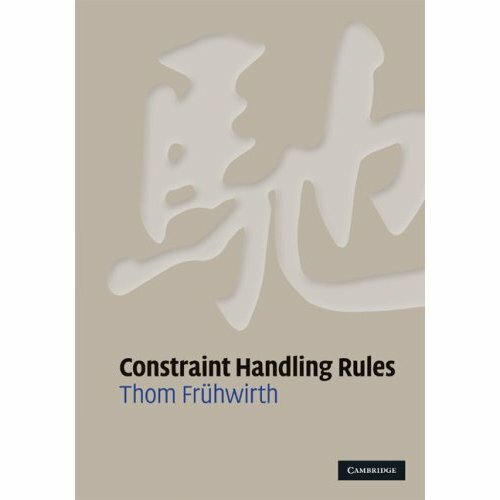 - Recent Research of Thom Fruehwirth on Constraint Handling Rules (CHR). - Talk in German about Applications of CHR on Youtube (Slides in English): Computer knacken harte Nüsse: Von Sudoku über den Aktienhandel zum Robotersegeln, also at iTunes U.
CHR Logo - the Chinese Symbol "CHR"
This book, written by the creator of Constraint Handling Rules (CHR), describes the theory of CHR and how to use it in practice. After a basic tutorial, the author describes in detail the CHR language and discusses guaranteed properties of CHR programs. The author then compares CHR with other formalisms and languages and illustrates how it can capture their essential features. Finally, larger programs are introduced and analyzed in detail. These include constraint solvers and implementations of classical algorithms. The book is ideal for graduate students and lecturers, and for more experienced programmers and researchers, who can use it for self-study. Exercises with selected solutions, and bibliographic remarks are included at the ends of chapters. The book is the definitive reference on CHR. Contents and Preface (preliminary version). Book excerpt: First Steps in CHR. Stock Broking - Mike Elston, Director of Systems Development, SecuritEase, Wellington, New Zealand. Automatic Test Data Generation - Ralf Gerlich, BSSE, Immenstaad, Germany. Injection Mold Design - Alan Baljeu, President, Cornerstone Intelligent Software Corp, Windsor, Canada. Smart Database with Constraints - Molham Aref, Logic Blox Inc, Atlanta, USA. Cognitive Brain for Service Robotics - Teresa Escrig, CEO, Cognitive Robots, Castellon, Spain and Seattle, USA. Optical Network Routing - Jonathan Weston-Dawkes, Mitre Corp, Bedford, USA. CHRjs Project - Matt Delaney, New Ocean Health Solutions, Conshohocken, USA. Unit Testing Tool AgitarOne for Java - Agitar Software, Mountain View, USA. WebCHR: Test-Drive CHR. Run full-fledged CHR online now! Play with 40+ example programs or write your own. SWI Prolog (SWI Prolog Reference Manual 7.1), Sicstus Prolog (Sicstus Prolog User's Manual), Yap Prolog, XSB Prolog, hProlog, Ciao Prolog, B-Prolog. ToyCHR (simple compiler and interpreter for any Prolog). The CHR Plug-in is an extension for Eclipse which allows users to develop CHR programs with a combined editor, executor and visual tracer. The editor provides syntax coloring, syntax checking, auto-completion etc. A wizard allows users to easily generate CHR files and projects. (Accompanying paper). 5. Open Eclipse and install the plug-in. Online Tool that translates CHR extensions like priorities, negation and random execution and programs in other rule-based approaches and formalisms like term rewriting and functional programming to CHR according to Chapter 6 of the CHR book (see above). Online Tool that inverts CHR rules for backwards execution. (Accompanying paper). From XML Schema to JSON Schema - Comparison and Translation with Constraint Handling Rules, (tool download). An extensible Eclipse platform for analysing graph transformation systems in CHR (pdf) (Eclipse Plug-in tar-file). Courses by the author based on the book were held for example at the University of Ulm in 2009 (and every year thereafter), at the University of Venice in 2009, at the The CHR Working Week 2009, First CHR Summer School 2010 , Second CHR Summer School 2011, 3rd CHR Summer School 2013. CHR Exercises, 2009: Exercise 1, Exercise 2, Exercise 3, Exercise 4, Exercise 5. CHR CP Exercises, 2009: Exercise 2, Exercise 3, Exercise 4 (boole.pl), Exercise 5, Exercise 6 (dl-ex6.pl), Exercise 7 (fd-ex7.pl). CHR CP Exercises, 2006: Exercise 5, Exercise 6, Exercise 7, Exercise 8, Exercise 9, Exercise 10, Exercise 11, Exercise 12, Exercise 13. CHR Summary (pdf, 2 pages) "The story so far"
WebCHR: Test-Drive CHR. Run CHR online now! Recent Research of Thom Fruehwirth on Constraint Handling Rules (CHR).